Probate is the process by which a court authenticates a will and grants the deceased's personal representative, or executor, the authority to distribute the estate. When an individual dies, leaving property solely in his name and with no transfer-on-death designation, it will likely be necessary to probate his will. For example, if the testator dies leaving a home of which he is the sole owner and a bank account in his name only, with no transfer-on-death designation, probate will be necessary to pass these assets to his heirs. Most states have small estate laws, allowing a simpler, less time consuming process for estates that do not exceed a certain value. In New York State, estates comprised of only personal property, not exceeding $30,000, can be settled through a small estate proceeding. This proceeding cannot be used to pass real property in New York. In California, a small estate proceeding can be used if real and personal property combined do not exceed $150,000. California also allows an expedited process for passing real property that does not exceed $20,000 in value. Check with your local probate court for small estate limits in your state. Some states provide an even more streamlined procedure. For instance, in New York and California, heirs can use a simple affidavit to collect assets that would otherwise be subject to a court procedure. The affidavit is presented to the institution holding the asset, such as a bank. State laws limit the value of these assets and designates who should sign the affidavit. Joint ownership of property can, in some cases, avoid probate. Most people die leaving at least one bank account. If it is owned jointly with another individual, the account will automatically pass to the survivor upon the death of the joint owner. Bank accounts and other financial accounts, such as retirement accounts and mutual funds, can also pass through transfer-on-death designations. This means the owner of the account can designate to whom the account should pass upon his death. 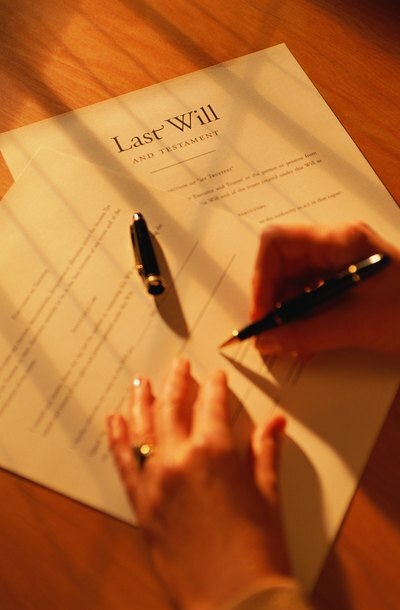 It is important to note that transfer-on-death designations override a bequest in a will. If an individual leaves the proceeds of a financial account equally to his three children in his will, but names only one child on the transfer-on-death designation, the entire account will go to the named beneficiary. Depending on how it is titled, real property may also pass outside of probate. Commonly, married couples own their home as joint tenants with the right of survivorship, sometimes referred to as owning property as tenants by the entirety. This means that when the first spouse passes away, the home will automatically pass to the surviving spouse. Unmarried individuals can also own real property jointly, with a right of survivorship. Language to this effect must specifically appear in the deed noting the owners hold the property as joint tenants with the right of survivorship."